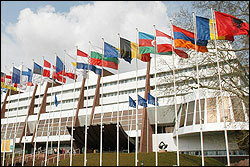 The Council of Europe's Vienna Summit in October 1993 set out new political aims. The Heads of State and Government cast the Council of Europe as the guardian of democratic security - founded on human rights, democracy and the rule of law. Democratic security is an essential complement to military security, and is a pre-requisite for the continent's stability and peace. During the Second Summit in Strasbourg in October 1997, the Heads of State and Government adopted an action plan to strengthen the Council of Europe's work in four areas: democracy and human rights, social cohesion, the security of citizens and democratic values and cultural diversity.